The icon boxer brief provides an athletic fit. Reference the size guide below to find your perfect waist size and length. Measure across bottom edge of waistband, double this measument. The icon performance boxer brief moves with you and provides comfort where you need it most. Built with our proprietary quad-blend fabric, it is the breathable base layer you will never train without. For optimal comfort, wear it underneath your favorite HYLETE short. Quad-Blend: Proprietary quad-blend fabric leverages the unique properties of 4 distinct fibers to create optimal stretch, resiliency, wicking, and durability. 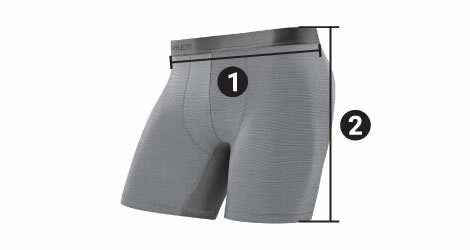 Perfect Stretch: 4-way stretch allows for unrestricted movement while keeping boxer briefs comfortably in place. Abrasion Resistant Gusset: Decreases friction and improves durability. Flat-lock Stitching: Minimizes chafing and provides long lasting durability. Waistband construction: Thin, high stretch waistband minimizes bulk at the waist and offers a secure and comfortable fit.